The purpose of this theoretical chapter is to identify strategies that help educators develop online learning curricula to meet the needs of culturally diverse students. The first part of this chapter offers insights into culturally responsive teaching (CRT) from multiple perspectives. Specifically, the authors explore the importance of CRT in teacher education programs, how to evaluate teachers' cultural competencies, how to initiate the transformation process into culturally responsive educators, how teachers perceive the value of CRT programs, what pre-service and novice teachers typically struggle with in their attempts to teach diverse student populations, and how students perceive cultural diversity. 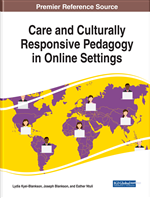 The second part of the chapter is dedicated to an in-depth discussion of practical approaches to developing culturally responsive online curricula for both 2D and 3D learning environments, how to prepare faculty to meet the needs of diverse students in online courses, and how to stimulate pre-service teachers' reflections on CRT. This chapter is based on the definition of culture as a relational phenomenon that emerges when people are interacting. Culture becomes tangible in the friction that happens when people move, take action, and develop affective relationships with each other (Tsing, 2005). Culture is “what a person employs in order to interpret and act on the world” (Barth, 2002, p. 1). Pre-service teachers (PSTs) in teacher training programs should get ample opportunities to reflect on the notion of culture, clarify their own understanding of culture, and explore the meaning of cultural diversity as a fluid concept (Barth, 2002; Tsing, 2005) so that they can develop a vision of what it means to be a culturally responsive (CR) educator. According to Villegas and Lucas (2012), CR educators demonstrate socio-cultural consciousness, have affirming views of culturally diverse students, perceive themselves as responsible for bringing about change “that will make schools responsive to all students” (Brown, 2007, p. 59), are proponents of constructivist learning, are dedicated to learning about who their students are and how they learn best, and are willing and capable of building instruction on students’ prior knowledge. The process of transforming into a culturally responsive teacher takes time and cannot be achieved by merely following a set of instructions, although previous research indicates that this is exactly what some teachers are looking for (Leseth & Engelsrud, 2017). In this process, it is critical for educators to become knowledgeable about the role that culture and language play in learning, to understand how cultural contexts may influence interactions among students as well as student-teacher interactions, to recognize students’ sense of their own culture, to offer the best possible support to diverse learners, to create learning experiences and use varied teaching styles that are motivating and beneficial for all students (Chu & Garcia, 2014; Ford, Stuart, & Vakil, 2014; Gay, 2002; Ladson-Billings, 1995; Wlodkowski & Ginsberg, 1995). The following clarification aptly describes what culturally responsive teaching is not. We want to make it clear that being a culturally responsive teacher is not simply a matter of applying instructional techniques, nor is it primarily a matter of tailoring instruction to incorporate assumed traits or customs of particular cultural groups (Villegas & Lucas, 2012, p. 27). Culturally responsive pedagogy (CRP) has seen several iterations since it was made popular by Ladson-Billings (1995) as a pedagogical approach “that empowers students to maintain cultural integrity, while succeeding academically” (p. 465). Paris (2012) introduced the notion of culturally sustaining pedagogy aiming to foster linguistic, literate, and cultural pluralism in addition to cultural equality. One commonality among varied approaches to CRT (Gay, 2002; Ladson-Billings, 1995; Villegas & Lucas, 2012; Wlodkowski & Ginsberg, 1995) is that teachers’ basic assumption must be that all culturally and linguistically diverse students want to learn (Brown, 2007). Asynchronous: Asynchronous communication happens at different times. Discussion forums, for example, are often asynchronous because the participants contribute their posts at different times. An advantage of asynchronous communication is that the participants have ample time to read and reflect on other participants’ posts and to carefully prepare their own contributions at their own pace. Social Presence: Experiencing a sense of presence involves feeling immersed in a computer-mediated environment. The concept of social presence has been associated with satisfaction, a reduced sense of isolation, and an increased sense of achievement in a virtual learning environment. Culturally Relevant Pedagogy: Lesson design intended to address the needs of diverse multicultural student populations. Synchronous: An example of synchronous communication is a live group discussion on an online platform to which all participants contribute simultaneously. An advantage of synchronous communication is the potential to increase one’s sense of community with the other contributors, one’s level of engagement, and one’s sense of immediacy due to immediate reactions one might receive. Immediacy: Interacting and communicating synchronously with other avatars increases the potential of experiencing a sense of immediacy in a 3D virtual world. For example, getting immediate feedback from another avatar via verbal or non-verbal communication or through movement or touch increases one’s sense of immediacy. Culturally Sustaining Pedagogy: Lessons and instruction designed to maintain the unique linguistic and cultural background of individuals and communities. Embodiment: Embodiment refers to the sense of physical presence that the user “behind” an avatar in a 3D immersive virtual environment might experience. Embodiment has been associated with an increased sense of social presence.